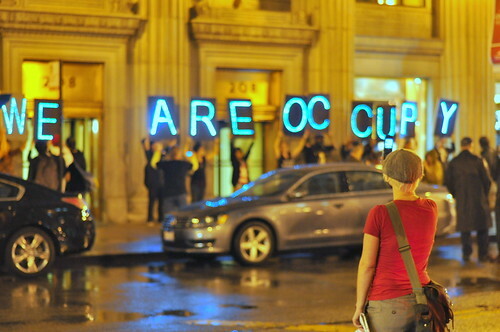 Occupy Love is an ambitious documentary. In an hour and 30 minutes, it attempts to offer a short history of Occupy Wall Street. It traces the roots of the movement back to the streets of Tunisia in December 2010 and through the plazas in Spain in the summer of 2011. In parallel to these clips from recent history, its interviews plumb the big ideas that undergird the Occupy movement. Interviews with activists, writers and thinkers run the gamut from the gift economy to western civilization’s estrangement from the natural world. but God did not will to save us without us. I have always found good company with the apostle Paul in his letter to the Romans when he writes about the groaning inside all of us: “for we do not know what we ought to pray for, but the Spirit intercedes with groans too deep for words” (Rom 8:26). Does it seem a little unholy to start a conversation about the triune nature of God by paying attention to the groaning in our gut? The Trinity doesn’t belong there, right? Shouldn’t we start up in heaven? Isn’t it a bit self-centered to turn a sermon on the Trinity into a sermon about us? Isn’t God supposed to be way over there, or way up there? As the prophet Isaiah says, “I saw the Lord sitting on a throne, high and lofty” (Isa 6:1a). Now, to be fair to Isaiah’s vision, God isn’t completely distant: “The hem of God’s robe filled the temple” (v. 1b). There is a point of connection between heaven and earth, and that is the Temple. But in Romans, Paul seems to think that God’s presence is even more intimate than that: God is in us, in our groaning, in our sighs, in our prayers, God’s Spirit is a companion with our spirit. Here’s what Paul says: “When we cry, ‘Abba! Father!’ it is that very Spirit bearing witness with our spirit that we are children of God” (Rom 8:15b-16). Through the Spirit, God becomes intimate with us, interior to us, completely familiar, a companion. The Holy Spirit is present in our spirit, groaning with us, crying out with us. And with the groaning we begin to get a sense for the Trinity; we become the site of the work of all three persons—Father, Son, and Spirit. Our bodies become God’s home. God rests with us, and in us, not as some outside power, not as some cosmic clockmaker, not as some bearded old king on a throne in heaven. God isn’t an outsider to our lives. God isn’t like a king or a president who might choose to save us by sending his troops. God doesn’t send others to do the dirty work. God sends God. That’s why we confess that Jesus is God. If Jesus is not God, then we worship a God who refuses to jump into our mess, then we serve a God who doesn’t like to get dirty. If Jesus is not God, then we praise a God who doesn’t want to get too close—a God who refuses intimacy, who refuses the risks that come along with becoming our friend, our companion. While I approve of his stand, I must disagree with the theological conclusions of his article. In speaking of two kingdom theology, Professor Weaver emphasizes the passive inaction of the theology. That it has nothing to say to oppression, that God is the God who empowers violence and the non-resistant have nothing to respond to injustice. Perhaps this is the form of two-kingdom theology that Professor Weaver learned, and I can see with a title like “non-resistance”, a theology might be prone to inaction. Certainly passivity is a concern among many who are raised “non-resistant”. I had a mysterious conversation with the emergency services manager of Gresham and the fire marshal a couple weeks ago. I was talking to them about the need of people sleeping on the street and how much danger they are in, especially when it gets below freezing. I spoke of Fred, whose leg was cut off a couple months ago because he had slept outside in freezing conditions. I spoke of the sixteen year old girls who have been sleeping outside all winter. And about a father and his sixteen year old pregant daughter who found themselves desperate without shelter.